Since I have not taken any outfit pictures this week (and because I have been getting settled back into college) I thought I would do another TBT post, since I haven't done one in awhile. On that note, I was going through my pictures and decided it would be fun to share some outfit pictures that I never did share on the blog (because they were taken before I started a blog) and so here are a vast array of outfit pictures of me from when I was 16 to my high school graduation (crazy to think it has been that long). I realized that when I first got into wearing vintage I used to wear my hair in victory rolls, curls, and scarves all the time. Evidently I have become a little lazy (understatement) when it comes to doing my hair up in a vintage style, and I really need to get back into styling my hair more vintage. Anyways, lets talk a little bit about these outfits! Now this outfit is one of my faves! I actually don't think I have worn this combination in about 2 years. However, it is another one of those ensembles that looked all out vintage from my hair down to my shoes and that is probably why I love it so much. 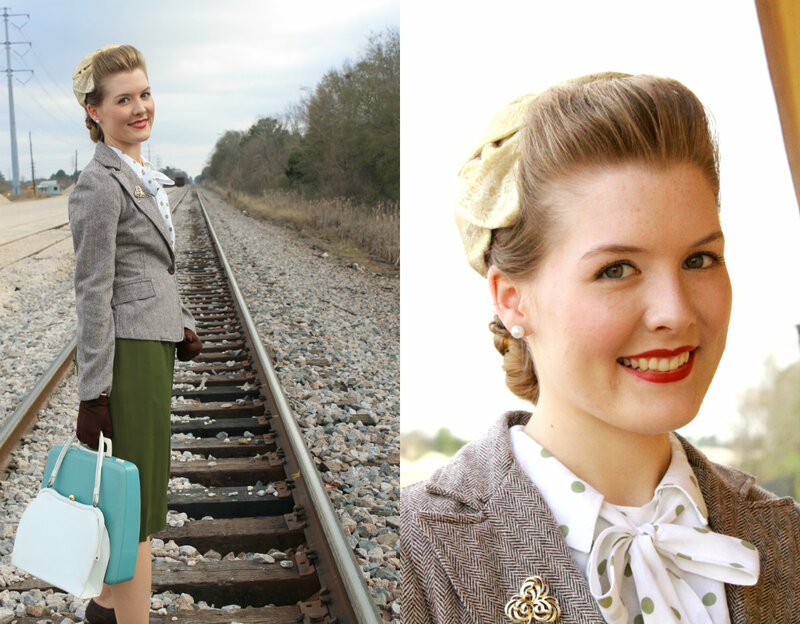 The more I look at my hair the more I miss those victory rolls...I need to bring these back in my hairstyles! Furthermore when your dad comes from an old country town you have to go take pictures after church when you are visiting for the weekend. However, as much as I could go on about the perfect brick walls for picture taking I will just talk a little about this ensemble before I move on. 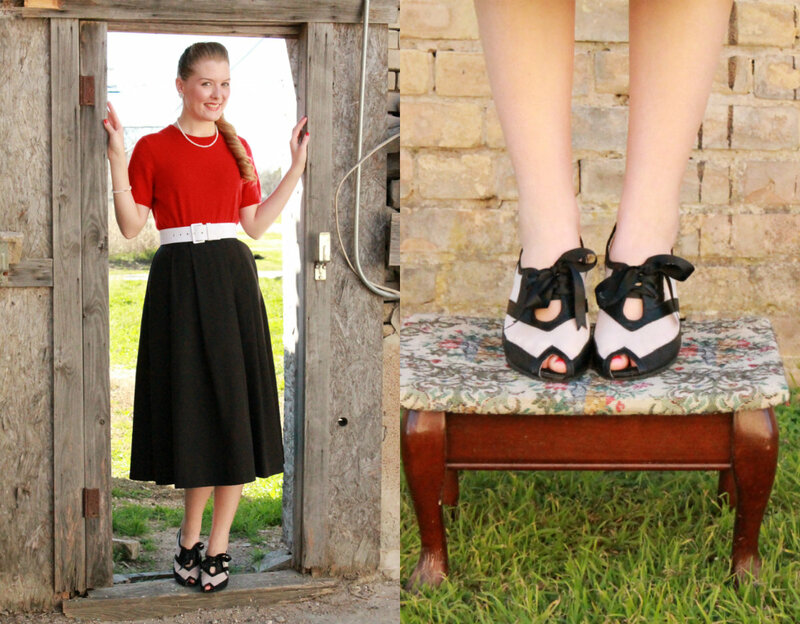 I love the combination of red, white, and black that this ensemble combines but my favorite part is the shoes. These are actually dancing shoes that I got on my birthday while at the annual Square Dance Hoedown. 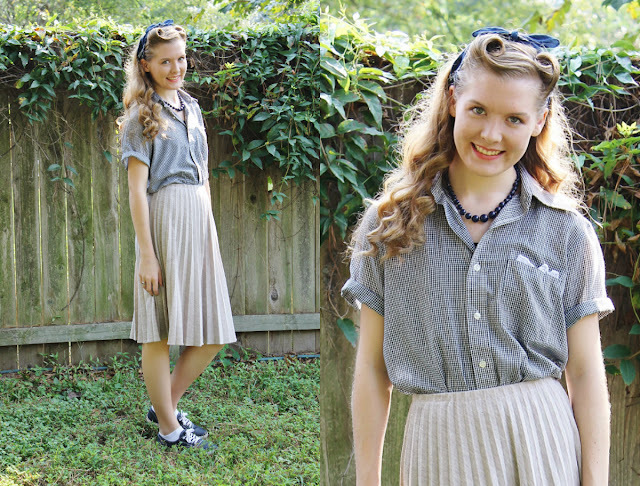 Lets just say they are SUPER comfortable and perfect for a 1950's or 1940's look (hopefully they will hit the blog in a real post sometime soon). Next, is one of the outfits I wore for my senior pictures. 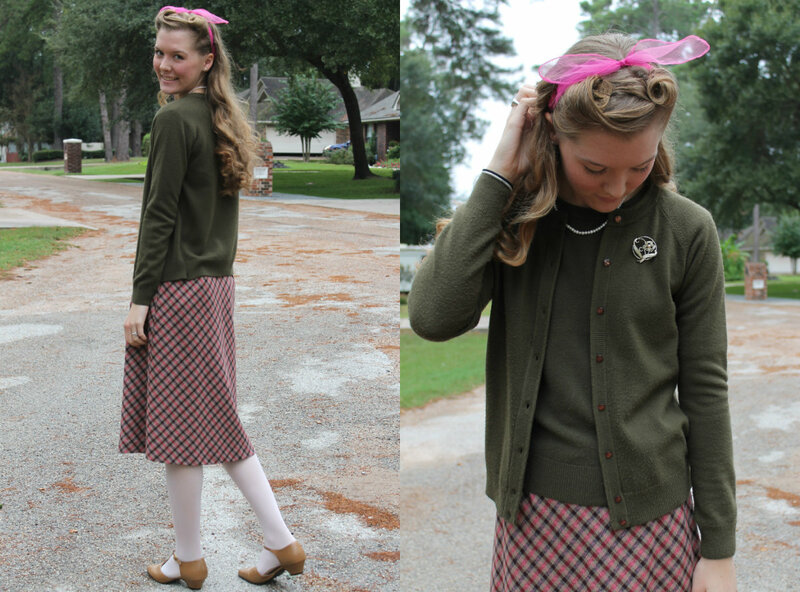 I decided to take pictures in ensembles from my favorite eras....thus this one was for the 1950's. I wore a fun lime green dress that I had refashioned to be my size. 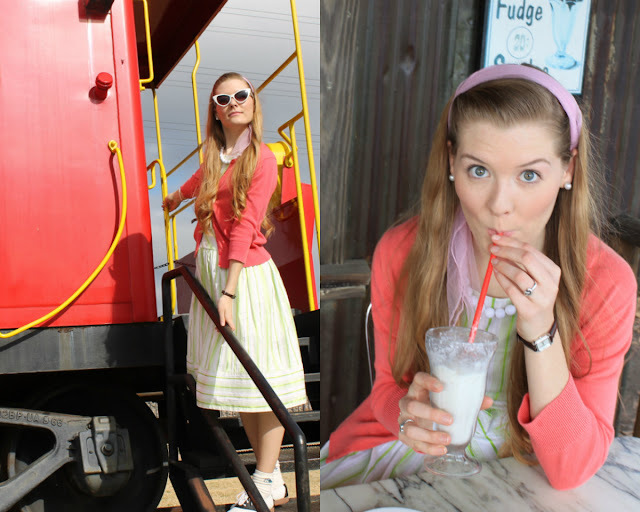 Of course if you are going to visit your local old fashioned soda fountain during the photo shoot you just throw on a few more colors, grab a milkshake, and snap a few pictures while you are at it. Do you like TBT posts? Oh thank you dear:) That last ensemble would probably have to be my favorite too! I loved using those pictures when I graduated and definitely looking like a character from an old movie! Stellar outfit photos one and all. I especially like the incredibly lovely and deeply sophisticated suit ensemble you wore for your senior photos. I am so in love with your last outfit. So sophisticated and so 40's. I love all of these outfits, but I would have to say that my favorites are the first outfit,the red, white, and black ensemble, and, of course, the last one! :) And I know what you mean about styling your hair vintage! 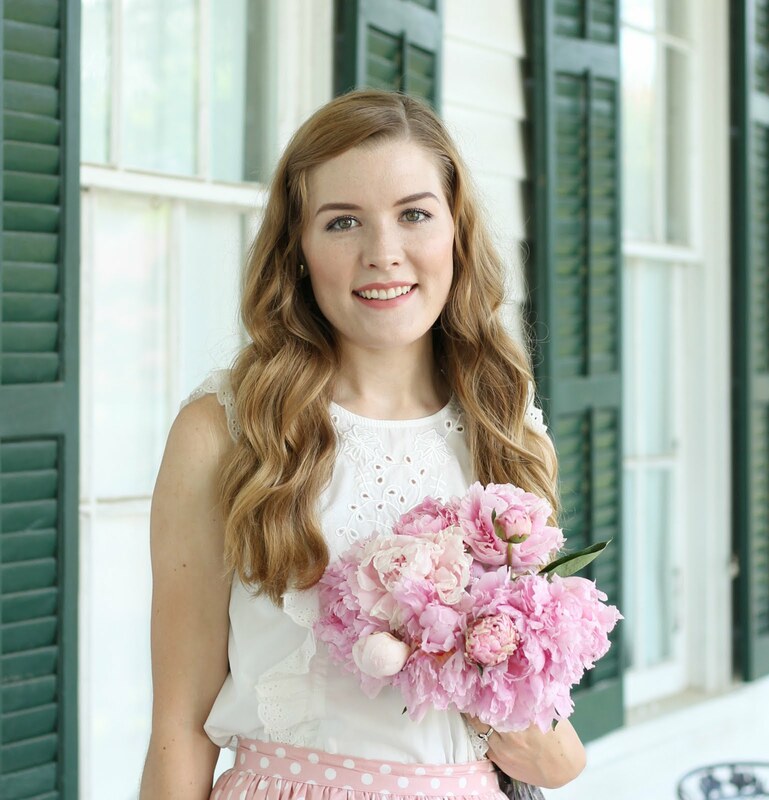 I love pin-curling my hair, or putting it in sponge rollers, but I just don't do it often enough! :) Good luck with the upcoming schoolyear! I completely agree with Naomi that you look like a movie star in that last outfit. It's perfect!!! I also love your second to last outfit and your first one. So adorable! These outfits are so adorable! I especially like the green dress that you wore for senior pictures- it is so simple and dreamy. I'd have to say that #1&4 are my favorites, but they all are amazing! Have a fabulous day! 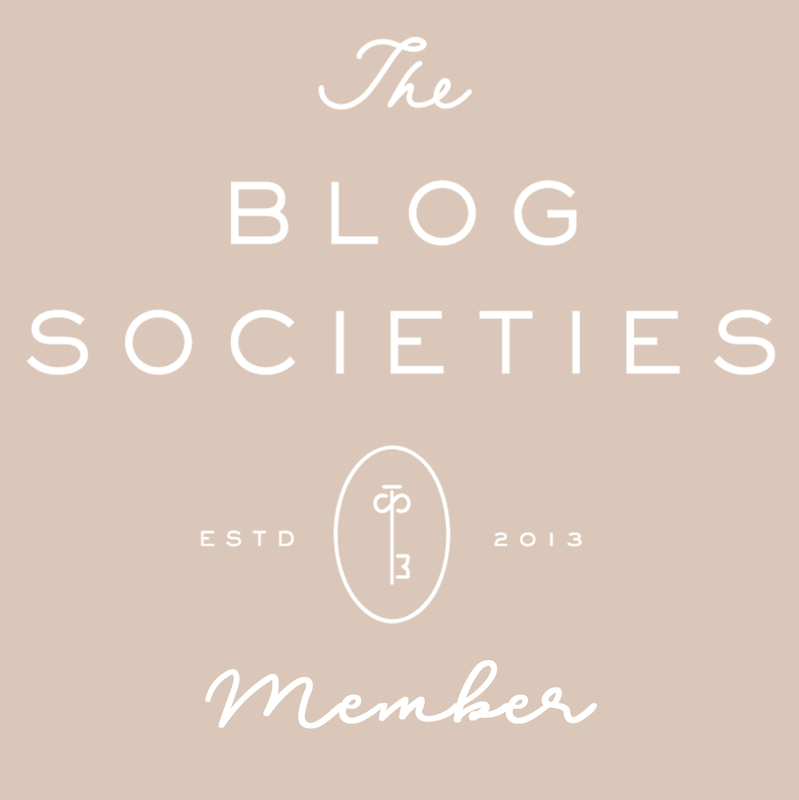 I'm a new blogger, and would love it if you could check out my blog! 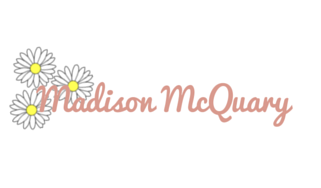 All of the outfits that you shared today are lovely Madison, but I would have to say that my favorite is the 1940s outfit. You look SOO elegant! And that jacket is just splendid. Oh, and those swing dancing shoes are quite enviable too!